Arthur Mercer was born in Frazer, Kentucky February 3, 1921. Art had greater expectations for his life than rural Kentucky promised, “I just did not like farm life.” “I was tired of using a mule’s rear end for a compass.” So, he traveled to Louisville and enlisted in the United States Navy in November 1939. Mercer attended boot camp at Great Lakes, Illinois completing his basic training in March 1940. The Navy assigned Art to the USS Salt Lake City (CA-25) a heavy cruiser and part of the Hawaii Detachment of the US Pacific Fleet, stationed at Pearl Harbor. Rated a gunner’s mate, Mercer’s battle station was in the No.2 8-inch/55 caliber gun turret just forward of the cruiser’s bridge. Mercer’s first war-time cruise (January to March 1942) was to Australia which had been at war since 1939. Under constant threat of Japanese invasion, the Australians were grateful to see their first American warship after many years. The local ladies welcomed the young American sailors as the nation’s young men were away fighting with the British 8th Army in North Africa. There were parades, free drinks and invitations to dinner in private homes. A photographer selected him and three of his shipmates to have their pictures taken at the zoo in Brisbane with koalas. The newspaper publicity led to the invitation to join an Australian family, also named Mercer, at their home for dinner. That summer, the Salt Lake City sailed to Wellington, New Zealand, where it joined the task force that delivered the First Marine Division to Guadalcanal, the battle which began the long road to Tokyo and victory in the Pacific. Luckily for Art, the Salt Lake City was elsewhere when the Navy suffered its greatest defeat in history at the Battle of Savo Island (August 8-9). Mercer was present, however, when the Navy exacted a measure of revenge at the Battle of Cape Esperance (October 11-12). Salt Lake City and eight other ships, closed to within 1,000 yards of the Japanese fleet, at night, and took them by surprise. Art remembers that the concussion of the 8-inch guns was so strong that he had to wrap his pant legs with string, lest the force rip the bottoms of his pants. “If you knew you were going into battle, you had to remove all the light bulbs,” otherwise the concussion would blow them out. The Salt Lake City lost only seven men while sinking one Japanese light and one heavy cruiser. After making ports-of-call in North Africa, SC-1043 joined Operation Avalanche, the invasion of the Italian mainland at Salerno in September 1943. “We had plenty of action,” recalls Mercer, but he never saw a German U-Boat the entire time he was in the Mediterranean. The barrels of the ship’s 40mm, 20mm and 50-caliber anti-aircraft guns blazed white hot, however. In one fourteen day period, SC-1043 survived twenty-nine separate raids by the Luftwaffe. At Salerno, the soldiers and sailors of Mercer’s task force witnessed the dawn of a new era in modern warfare. Between September 11 and 13, German high-altitude bombers dropped at least three Fritz-X radio-controlled bombs over the Allied fleet. His Majesty’s Transport Rohna was sunk by this new Nazi weapon. Two days later, the light-cruiser USS Savannah (CL-42) was heavily damaged by another glide-bomb. A near miss lightly damaged Savannah’s sister, the USS Philadelphia (CL-41). On duty in the Mediterranean until December, Art returned to the States on a Liberty Ship, landing in Baltimore on Christmas Eve 1943. He remembered clearly that dinner consisted of “Vienna sausages as the main entrée, and … pumpkin pie.” After a short leave where he “went back to visit the folks at home on the old farm,” Art attended Electrical-Hydraulic School in Washington D.C. Once trained on the most modern 6-inch gun technology he was transferred to the light cruiser USS Pasadena (CL-65). The brand-new Pasadena (Commissioned June 8, 1944) had twelve sophisticated 6-inch/55-caliber Mark 16 in four-triple turrets. Sent to the Pacific via the Panama Canal, the Pasadena fought “a lot of smaller actions with the big [carrier task] forces like Task Force 58 and 38.” Mercer took part in the Battle of the Philippine Sea (19-20 June 1944), better known as the ‘Great Marianas Turkey Shoot’ where the American’s completely decimated Japan’s remaining air force. “That’s where supposedly the Japanese lost about 350 planes in one day. The number may not be exact, but it was a huge number,” Art remembers. After the war ended, Art transferred to the heavy-cruiser USS Oregon City (CA-122), where he stayed for three years. 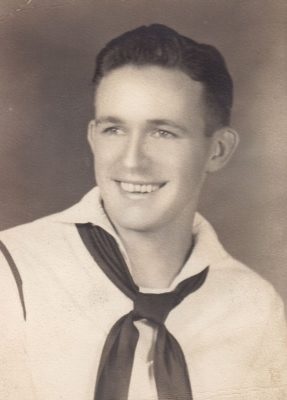 Next, the Navy assigned him to the Naval Training Station in San Diego where he was an instructor from 1948 and 1949. After Korea, Mercer did another tour at the Naval Training Center, San Diego, as Commander of Companies No. 172 and No. 326 in 1953 and 1954. Art finished his Navy career with two sea tours, the first aboard the USS Bayfield (APA-33), and the last aboard the Fire Support Ship-1, USS Carronade.